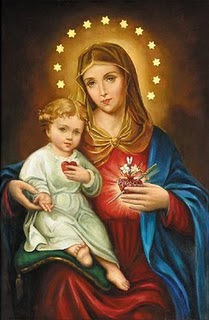 In this prophecy, the Blessed Mother of God holds out her Immaculate Heart to us. A [period of] time is stopped to accomplish, on you and by you, the promise of my graces. The return of my first victim is prepared. The moans and worries will no longer pass over her head, before she tastes the reward of her King and Father of Heaven. Heaven no longer closes for you with every vision. You see it out of the ecstasy, and keep the marvelous sight. … Yesterday, the good Saviour told me that his great victim was nearer to his consolation than he thought, and we also. (Allusion to the approaching death of Father David, which Mrs. Gregoire could not yet guess). “… The time is not far off when the trembling of the earth will occur. My Son can no longer endure satan’s reign over His people. The great era, my children, is not far off. [Source: pages 116-117, Le Ciel en Colloque avec Marie-Julie Jahenny, by Fr. Pierre Roberdel]. Well has she merited that title! For we can see here that Mrs. Gregoire is Marie-Julie’s confidante. Who are these souls? Those who have “gained victory under the Empire of Grace.” We can therefore suppose that these are the souls who have received the graces for conversion before their deaths. The Blessed Virgin Mary is the Queen of this “Empire of Grace”. Devotion to our Queen’s Immaculate Heart obtains this grace of deathbed conversions, and so, the Blessed Virgin Mary “opens her white cloak, [and] presents her Heart for [Marie-Julie’s] contemplation”, so that she (and we) will understand the devotion that attains such great intervention and results in such great graces. May we learn this devotion well and carry it out always with charity and deep gratitude! She gives this white cross to Marie-Julie, to France, to we who are in union with the See of the Cross. Is it then a white cross to represent the See of the Cross, the Papacy and the Church in Exile? Certainly, with the Papacy pushed aside, silenced since the death of Pope Pius XII, we have the Crucifixion of the Church. Remember that Marie-Julie was told that our devotion to the Cross of our Lord Jesus Christ would be the hope for our salvation. Let us then, each one of us, unite our heart, mind, and soul, to the Pope in Exile. Desire to be spiritually with him, to suffer this exile with him. The crown of white and red rose buds then symbolically represents the graces that we can gain from this union with the Pope in Exile, the Church in Exile: white being the purity that we will obtain for our souls, and red being the martyrdom that we will undergo willingly, as much in small daily privations or persecutions as in the greatest sacrifice -- if we should be so blessed! The Great Chastisements are, firstly, the Exile of the Papacy and thus the Church, and, secondly, the still-to-come Three Days of Darkness. 2. The second pronouncement remains a mystery: “The return of my first victim is prepared" appears in French in the masculine form, indicating the death of Father David, the priest about whom the notation is made. But then the reference is of a female: "The moans and worries will no longer pass over her head, before she tastes the reward of her King and Father of Heaven.” Yet Marie-Julie lives for a long time beyond the time of this prophecy, so the reference cannot be to her. Could it refer to the Church in her Exile, meaning that She will not be in Exile for very long? 3. And lastly, there is the promise that Marie-Julie will be given the consolation to remember, after her ecstasies, all that she has seen of Heaven, Christ our Lord, the Blessed Virgin Mary, and the other Angels and Saints during her ecstasies. The destruction of Catholic life since 1958 has been horrific. The physical destruction from the 3 Days of Darkness will also prove horrific. The satanic influences which have earthly power over everyone and everything, except the Exiled Papacy and Church, “can no longer [be] endure[d] by our Merciful Christ." You see, after the 3 Days of Darkness, the devil and his minions will be back in hell. However long it is that God will give us, one thing is certain: we will no longer be fighting the devil unchained, as we are now. Deo gratias! And may our devotion to the Immaculate Heart of Mary gain the salvation of the many souls who are presented to us from day to day.